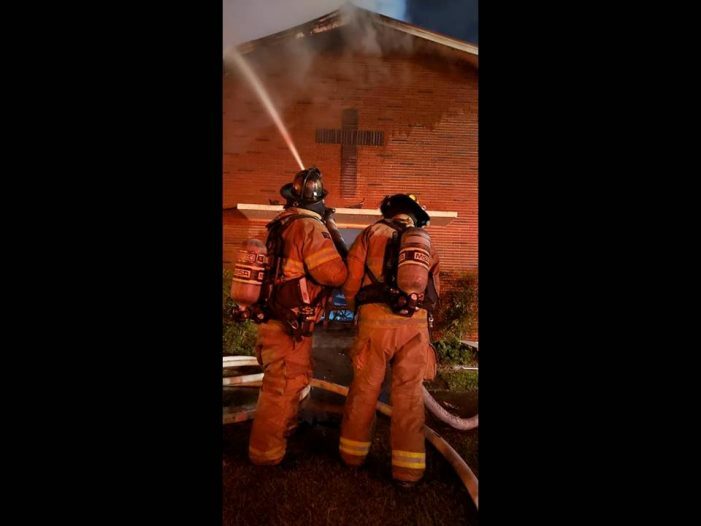 Firefighters from four different stations battled a blaze that destroyed Souls Harbor Pentecostal Church, located at 11818 N Ohio St., Dunnellon. According to Marion County Fire Rescue, at approximately 12:18 a.m., units responded to the church after a caller reported seeing flames emitting from the roof. MCFR Dunnellon Fire Station 3 was the first to arrive on the scene, followed by Rainbow Springs Station 22, Ray Lloyd Station 31, and Friendship Station 21. Firefighters intensely and offensively attacked the fire of the 5,000 square foot structure until it was called under control at approximately 12:58 a.m.
Units on Scene included E3, E22, E31, R31, R22, L21, Sq21, Div1, DC4, MCFR Safety, A103, Rehab25, and STFM. The cause of the fire is under investigation by the State Fire Marshal’s Office.